Marco Galvani is a composer based in London. His choral, operatic, and instrumental music has been performed throughout the UK, Europe, and America. Marco's choral works are published by Edition Peters, and have been commissioned by ensembles such as The Sixteen, Sansara Chamber Choir, The Arcadian Singers, and Salisbury Cathedral Choir. Marco's instrumental music has been performed by CHROMA, Oxford University String Ensemble, and the Zeitgeist Chamber Orchestra. 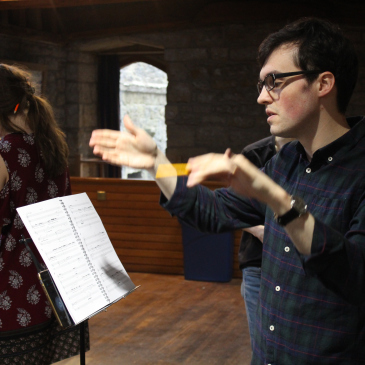 His first chamber opera 'Rothschild's Violin' led David Threasher to describe Marco as a 'compositional voice of genuine promise' in the Oxford Culture Review. Vox Luna Chamber Choir perform Marco’s setting of Hardy’s ‘The Oxen’, at the Wallace Collection as part of their Christmas Concert, 2018. Sansara Chamber Choir perform ‘The Oxen’, as part of their Fifth Anniversary Concert in Winchester. Sansara Chamber Choir perform Marco’s setting of Hardy’s ‘The Darkling Thrush’ as part of their ‘Music Of the Spires’ series. Rachel Hepplewhite performs Marco’s new commission from Borough New Music in St George the Martyr Church, London. The Sixteen perform Marco's new commission 'Stella Caeli' in Ayrshire as part of the Cumnock Tryst. Sansara perform a new work by Marco as part of their Music of the Spires series in Saint Michael and All Angels Church, Oxford. Marco's commission for the Southern Choirs Festival 2018, 'O Sacrum Convivium', was performed by the combined choirs of Salisbury, Winchester, and Chichester Cathedrals. The National Youth Choir of Great Britain Fellows performed Marco's setting of 'Ave Sanctissima Maria' in their final recital of their residency. Sansara Chamber Choir performed Marco's 'Ubi Caritas' alongside Fayrfax and Parsons as part of their 'Music of the Spires' series. The Chester Bach Singers performed Marco's Emily Dickinson settings alongside works by Bob Chilcott. Consortium Novum of Oxford performed Marco's newly commissioned piece 'Unearthed' for chamber orchestra, alongside Beethoven's Ninth Symphony. Marco's anthem 'Faith is the gift of God to his people' from 'Three Anthems' was performed at St Pancras Parish Church during Evensong, as part of the London Festival of Contemporary Church Music. Marco's Latin setting of the Nunc Dimittis was performed at Hampstead Parish Church during Evensong, as part of the London Festival of Contemporary Church Music. Marco's Missa Brevis was performed at St Magnus the Martyr during Eucharist, as part of the London Festival of Contemporary Church Music. Marco's Missa Brevis was performed at St James Sussex Gardens during Eucharist, as part of the London Festival of Contemporary Church Music. Marco's Missa Brevis was performed at Hampstead Parish Church during Eucharist, as part of the London Festival of Contemporary Church Music. Marco's new work for the London Accordion Orchestra was performed at the Royal Academy of Music. James Orrell performed Marco's new piece 'Beneath the sky' for solo baroque viola, alongside works by composers from the Royal Academy of Music. Marco's new work for The Hermes Experiment was performed at the Royal Academy of Music in a concert of new works for soprano and ensemble. The Choir of Mary Magdalen, Oxford, performed Marco's 'Missa Brevis', commissioned in 2015. Sansara performed Marco's 'Ave Sanctissima Maria' in Pusey House Chapel alongside works by Tallis and Parsons. Marco's new work for mallet quartet was performed at the Royal Academy of Music, led by Colin Currie. The Sixteen performed Marco's Christmas Carol 'On Christmas Morn' in their Christmas Tour, under the direction of Harry Christophers. Llandaff Cathedral Choir performed Marco's piece 'Ubi Caritas' at evensong. A live sample of the piece can be found here. Copies available from Edition Peters here.